Their second release "L’Écume des jours d’après Boris Vian" is a concept album, based on the 1947 philosophical novel "L’Ecume des jours" (Froth on the Daydream), by Boris Vian. 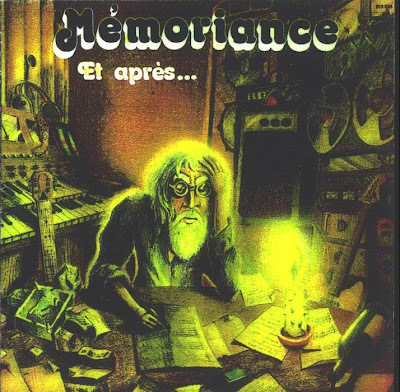 MEMORIANCE’s style on "Et Après", has somewhat of a jazz rock feel at times, but also prevalent is a strong bass sound, some luscious guitar playing (two lead guitars at times) - that is never outrageous - yet is skillfully played. There is also psychedelic rock moments, reminiscent of Pink Floyd, especially in the keyboard and guitar sounds. Overall, they’re never over-the-top or heavy, but they always manage to stay interesting, due to their songs having several movements. A relatively unknown and unique band, even in France, they have managed to record some excellent music and deserve to be heard. 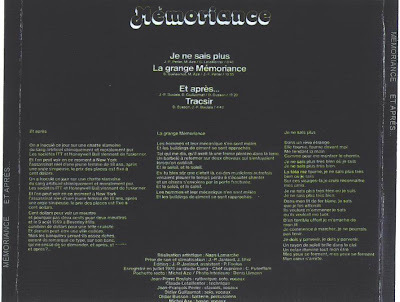 If you enjoy the ROGER WATERS era PINK FLOYD, ANGE, ATOLL, CARPE DIEM as well as other symphonic prog, you will enjoy MEMORIANCE. Any chance to get their other album? ?